Open Air Museum at Karnak temple contains some unique historical chapels that not to be missed while touring the temple itself. A new addition to the museum was recently inaugurated and now you can see even more chapels than before. Chapels at Karnak Open Air Museum. Alabaster chapel of Amenhotep I.
Calcite chapel of Amenhotep II. Decoration of the Red Chapel of Queen Hatshepsut. Red Chapel low part decoration. Wall relief of the Red Chapel. Beautiful relieves on the walls of the Red Chapel. White chapel of Sesostris I.
Courtyard with the colonnade of Thoutmosis IV. The excavations have been carried at Karnak since the end of 19th century. Thousands of decorated blocks and different objects were found at the site. The great number of these pieces, as well as their historical and artistic interest, have justified the creation of a museum to allow them to be viewed in the best possible conditions, not only for the specialists, but also for the public. 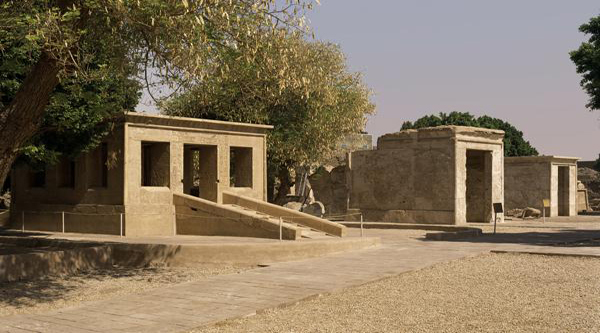 No doubt that the Open air Museum at Karnak is a very important historical addition to this vital monumental area. 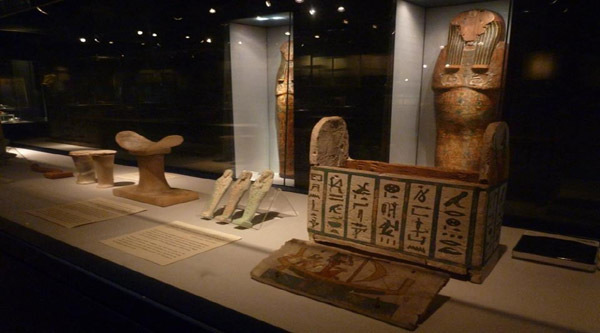 In 1987 the Egyptian Antiquities Organization decided to open the first part of the museum in order to display the most interesting blocks. Now when you are touring the open-air museum you can discover masterpieces, forgotten for centuries after their reuse in the great pylons of Karnak temple. The museum is located to the left side of the court yard and costs extra 25LE. The museum displays the most interesting blocks which belong to 3 chapels: The White chapel of Sesostris I, The Alabaster chapel of Amenophis I & The Red chapel of Hatshepsut. The blocks were mainly discovered during the excavation the interior of the 3rd pylon between 1923 to 1954. The area in which the remains of these monuments have been gathered since 1936 is located in the north-west corner of the great temenos wall of Nectanebo I. To arrange the museum in the best way it was decided to divide the area into two zones by a wall of a color and shape harmonious with the site. The 1st zone to the west is designed for the public, while the second zone to the east is reserved for the conservation of the blocks. In the 2nd zone a systematic arrangement of the blockes has allowed regrouping of the blocks of Sesostris I, Amenophis I and Thutmosis II on benches to prevent further damage to the pieces. The study undertaken on the newly arranged blocks and the restoration of the Sheikh Labib storehouse at Karnak (west of the temple of Ramses III) has enriched the new assemblage in the Open air Museum. Creation of a garden offers the visitors an agreeable and attractive area in which some of the oldest and most beautiful monuments of Karnak are presented. Dated to year 17 of Queen Hatshepsut's reign, ca 1473 BC. The function of this monument was to house the sacred bark of Amen. It is called a Red Chapel because of the beautiful colour of its quartzite walls, although the lower blocks and door emplacements were of black granite. The chapel was originally composed of 2 parts although its exact length is uncertain. A vestibule on the west and the bark repository itself to the east. Only app. 2/3 of the blocks from the chapel, 300 in all, have been discovered. Most of them were found inside and around the 3rd Pylon, between year 1923 and 1947. The decoration on the blocks is incomplete and it is possible that the chapel was never actually built. It is believed that the chapel stood in the sanctuary of the temple. Thusmosis III began to disfigure the representations of Hatshepsut on the blocks and then ultimately eliminated the chapel in order to erect one of his own in red granite. This one was replaced by the chapel of Phillip Arridaeus (323-317 BC) which is still in place in the central part of the temple. The blocks of the Red Chapel are unusual as each bears a complete scene. It is possible that the decoration was cut before the blocks were put in place. Unfortunately too many of the blocks are missing to allow a reconstruction of the chapel. It is a Middle Kingdom chapel built by Sesostris I (ca. 1980-1935 BC) and is one of the oldest and most famous buildings of Karnak temple. Where it originally stood in the temple precinct is unknown. Its blocks of fine limestone were reused by Amenhotep III to build the 3rd Pylon and they remained buried there for more than 3000 years. The carved relief on the pillars is of exceptional quality and represents Sesostris I in front of the god Amen. On the outside wall a series of columns lists each of the names, or administrative districts of Egypt, along with its size and capital city. The chapel was reconstructed in this area in 1935 and was restored in 1985-86. The blocks of this chapel for the sacred bark of Amen, built by King Amenhotep I, were found in the north-east corner of the 3rd Pylon between the year 1922 and 1927. And the chapel itself was reconstructed in this place in 1947.Its original position in the temple precinct is unknown, but probably it was originally at the site of the chapel of Thutmosis III on the east side of the sacred lake as the names of these two buildings are similar. The decoration of the chapel was completed by Amenhotep I except on the south exterior which was finished by Thutmosis I. The chapel, or bark repository itself, is depicted on two blocks from the Red Chapel of Hatshepsut. Inscriptions on the chapel doorway refer to the materials used in its construction. The alabaster came from Hatnub in Middle Egypt, while the wood and bronze for the doors came from Asia. In the interior the reliefs depict the sacred bark of amen on the upper part of the walls. Below, the King presents offering to Amen. On the exterior scenes of the ritual for the god are shown. Particularly noticeable is the beautiful style in which the hieroglyphs and figures, particularly those of the king, are carved. The style is quite different from that known on limestone blocks of the same period. Now visitors to Karnak Temples are able to admire the second chapel of the 18th dynasty Queen Hatshepsut after four years of restoration and reconstruction. The chapel was constructed in limestone to worship the ancient Egyptian god Amun-Re. It includes an open court and two inner halls embellished with blocks engraved with very distinguished religious scenes depicting Hatshepsut before Amun-Re, with her husband king Thutmose II, as well as their cartouches. Some of the blocks bear the name of Hatshepsut's predecessor king Thutmose III. The majority of blocks of this chapel were found scattered at the beginning of the 20th century in the Karnak courtyard cachette where a collection of gigantic colossi of different New Kingdom kings, queens, nobles and top officials as well as deities were discovered. Another batch of the blocks was found in mid 1950's during excavation works carried out by Sheata Adam and Farid El-Shaboury at the cachette. All blocks were stored in Karnak galleries until 2005 when the mission of the Centre Franco-Egyptian D'Etude des Temples de Karnak (CFEETK) restored the blocks, studied them and published their findings. The blocks stood on mastabas at the open air museum until 2008 when the CFEETK started a comprehensive reconstruction work on all chapels that were dismantled in previous ages. Some of its blocks were used in the construction of other monuments inside Karnak and elsewhere in Luxor. Hatshepsut's limestone chapel was reconstructed at the entrance of the open court. The newly reconstructed chapel, which is known as the "Sacred Monument," is a very important monument in ancient Egyptian history since it is one of the few still surviving records that attests explicitly to the power of Hatshepsut as ruler before her ascendancy to the throne as king.